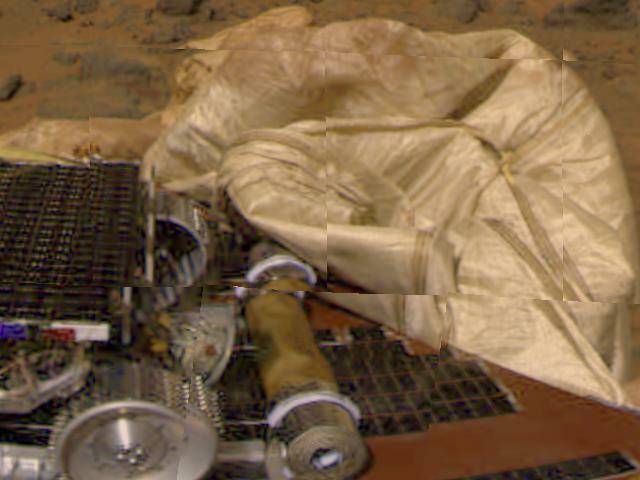 These images show that the Mars Pathfinder airbags have been successfully retracted, allowing safe deployment of the rover ramps. The airbags visible prominently in the top image are noticeably retracted at the bottom of the second image. The Sojourner rover is at lower right in this second image, and rocks are visible in the background. 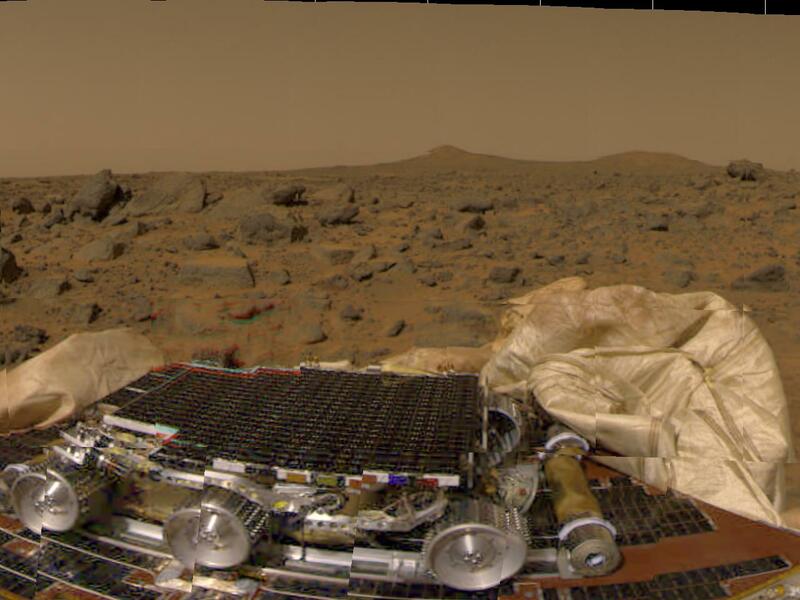 This picture from Mars Pathfinder was taken at 9:30 AM in the martian morning (2:30 PM Pacific Daylight Time), after the spacecraft landed earlier today (July 4, 1997). 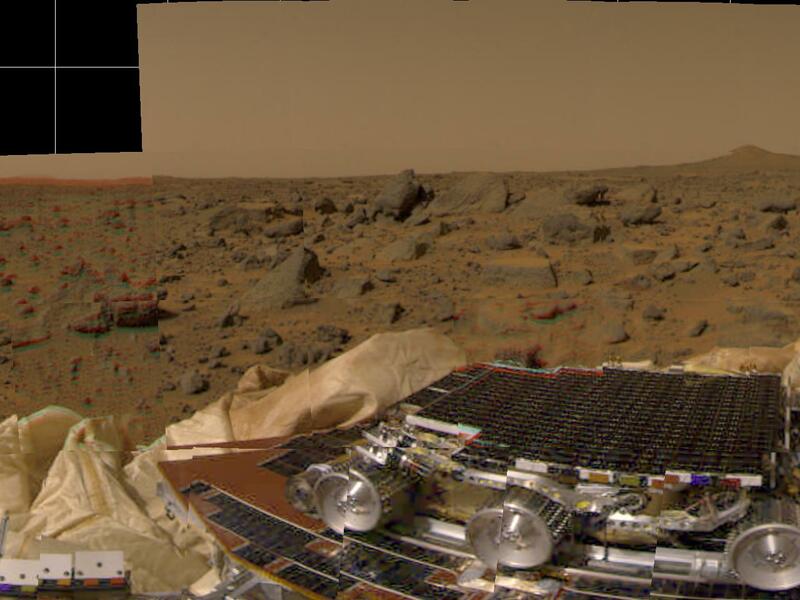 The picture shows these Sojourner rover perched on one of three solar panels. The rover is 65 cm (26 inches) long by 18 cm (7 inches) tall; each of its wheels is about 13 cm (5 inches) high. The white material to the left of the front of the rover is part of the airbag system used to cushion the landing. Many rocks of different of different sizes can be seen, set in a background of reddish soil. The landing site is in the mouth of an ancient channel carved by water. The rocks may be primarily flood debris. The horizon is seen towards the top of the picture. The light brown hue of the sky results from suspended dust. 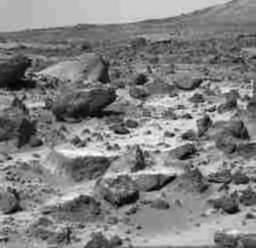 Large boulders are visible in this enlargement of pictures taken by the Mars Pathfinder lander camera on July 4, 1997. The landing site is in the dry flood channel named Ares Valles. The boulders probably represent deposits from one of the catastrophic floods that carved the ancient channel. Between the rocks is brownish windblown soil. The gray-tan sky results from dust particles in the atmosphere. This closeup picture of the Mars Pathfinder lander shows the front of the small Sojourner rover, perched on a solar panel. The white material in front of the rover is a portion of the air bag system. Beyond the air bag is the rock-strewn Martian surface. A number of image processing artifacts are seen in this picture. Most apparent are seams between sub-frames offsetting portions of the rover's wheels and solar panel, color fringes that result from viewing the rover from the two separated eyes of the camera, and blocky fringes near edges and smooth areas that are created by data compression. 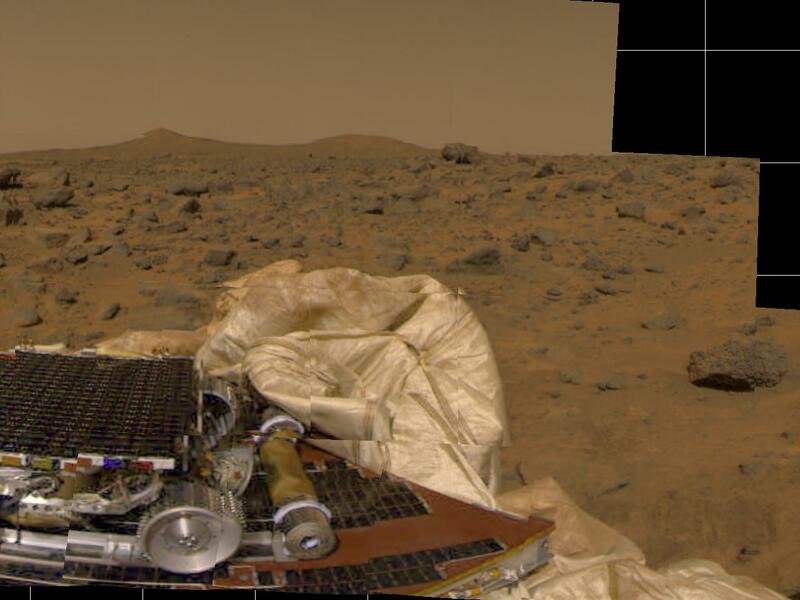 This is one of the first pictures taken by the camera on the Mars Pathfinder lander shortly after its touchdown at 10:07 AM Pacific Daylight Time on July 4, 1997. The small rover, named Sojourner, is seen in the foreground in its position on a solar panel of the lander. The white material on either side of the rover is part of the deflated airbag system used to absorb the shock of the landing. 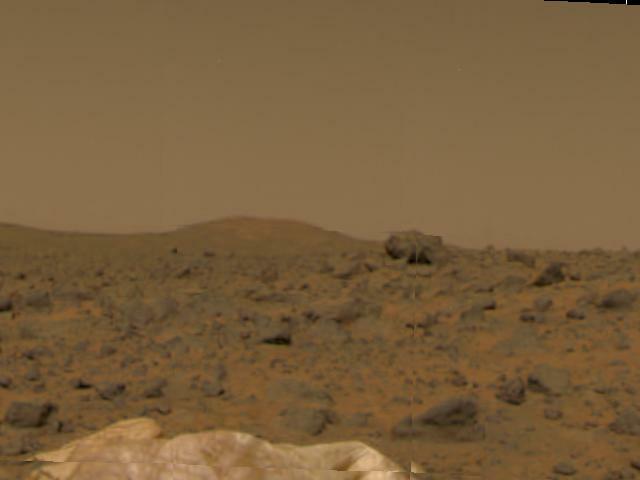 Between the rover and the horizon is the rock-strewn martian surface. Two hills are seen in the right distance, profiled against the light brown sky. 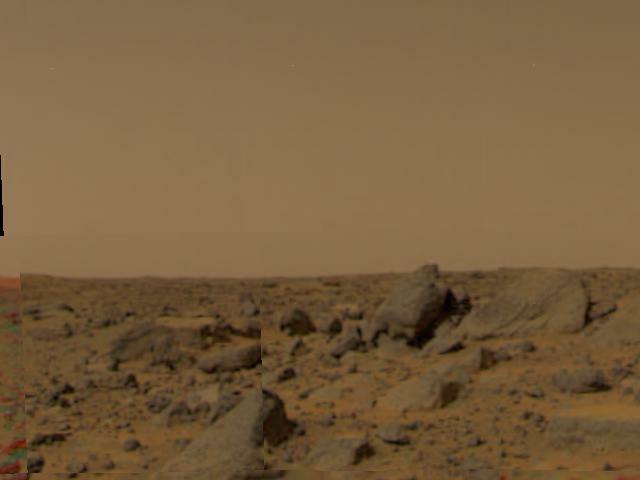 In this image from the Pathfinder IMP camera, a diversity of rocks are strewn in the foreground. A hill is visible in the distance (the notch within the hill is an image artifact). Airbags are seen at the lower right. 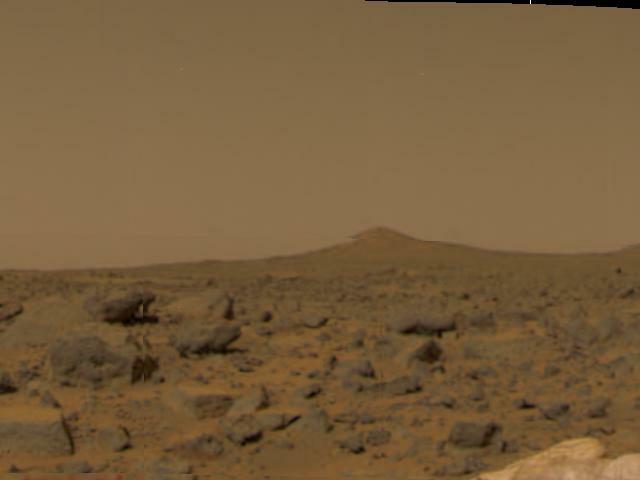 View of martian surface taken by the Imager for Mars Pathfinder (IMP), the camera on board the Mars Pathfinder lander. This image was taken in mid-morning on Mars (2:30 PM Pacific Daylight Time, July 4, 1997). Part of the small rover, Sojourner, is visible on the left side of the picture. The tan cylinder to the right of the rover is one of two rolled-up ramps by which the rover will descend to the ground. The white, billowy material in the center of the picture is part of the airbag system. Many rocks of different shapes and sizes are visible between the lander and the horizon. Two hills are visible on the horizon. The notch on the left side of the leftmost conical hill is an artifact of the processing of this picture. This image from the Pathfinder IMP camera shows the rear part of the Sojourner rover, the rolled-up rear ramp, and portions of the partially deflated airbags. The Alpha Proton X-ray Spectrometer is protruding from the rear (right side) of the rover. The airbags behind the rover are presently blocking the ramp from being safely unfurled. 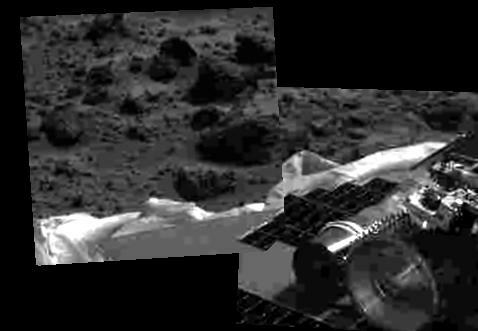 This image from the Mars Pathfinder IMP camera shows airbags in the foreground, a large rock in the mid-field, and a hill in the background. 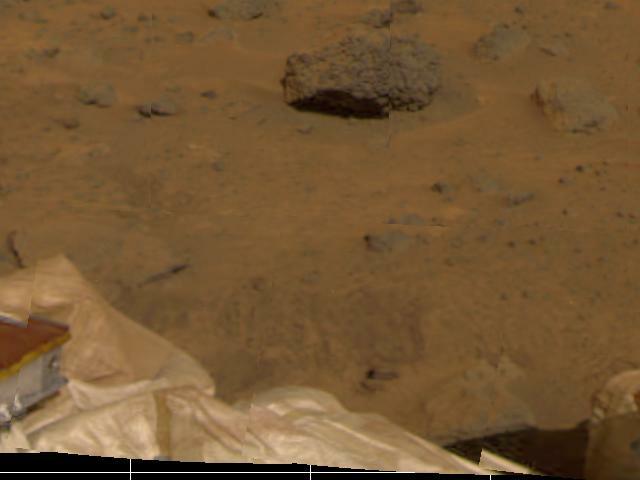 This image from the Mars Pathfinder IMP camera shows portions of the airbags, part of a petal, soil, and several rocks. The furrows in the soil were artificially produced by the retraction of the airbags after landing. The above image represents Humankind's return to the Red Planet. 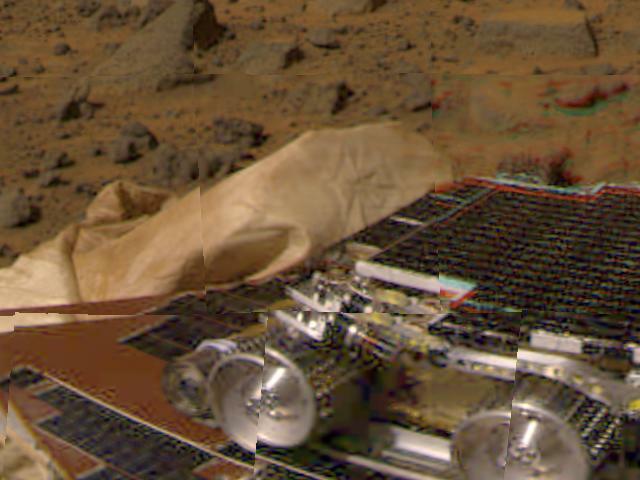 More than twenty years after the Viking I and II missions, Pathfinder has landed on Mars.